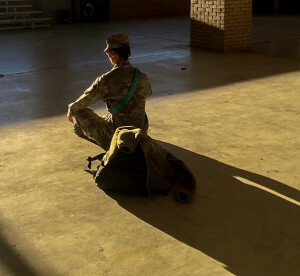 A Soldier practices meditation to relieve stress. The Army Research Laboratory has developed a new partnership with Helius Medical Technologies to launch a research program focusing on a neuromodulation stimulator that could enhance cognitive and psychological readiness through mindfulness meditation training. As part of a cooperative research and development agreement, or CRADA, ARL and Helius are launching a research program to investigate Helius’ Portable Neuromodulation Stimulator for the enhancing cognitive and psychological readiness and response through mindfulness meditation training. Helius is focused on neurological wellness. Researchers from both organizations will combine the use of the neuromodulator with mindfulness meditation training and assess participants’ neurocognitive performance and self-reported symptoms before and after training. ARL is studying the use of mindfulness-based stress reduction, or MBSR, and other forms of mindfulness meditation among Soldiers and veterans. ARL’s Dr. Valerie Rice, chief of the Army Medical Department Field Element at Fort Sam Houston, Texas, said early research demonstrates that active duty service members and military veterans who complete MBSR training achieve results that positively affect a Soldier’s readiness — a top priority of Army Chief of Staff Gen. Mark A. Milley. Research conducted at ARL’s Fort Sam Houston site focuses on active duty service members and veterans, rather than specifically on patients, in an effort to determine how mindfulness meditation training might serve both populations in a preventative manner by increasing resilience, improving mission performance, and strengthening cognitive and emotional readiness. In addition, ARL is examining how mindfulness meditation training assists individuals who have symptoms of PTSD or anxiety associated with their military service.